Q. Do you require a temperament test before I can make a boarding reservation for my dog? A. Yes, I conduct a temperament test during our meet and greet which consists of the following: a small walk with you and your dog around the corner, and observation of his body language during our walk and while we are sitting talking to each other. The reason I do this is because the dogs that vacation with me will spend most of their time with me and not in a crate, therefore they need to be able to get along with each other. Q. Do you board dogs that you have trained as well as those that you haven’t? A. I board dogs I have trained, and those I haven’t, but I charge a different rate for the latter. Also, there have been times when I have turned down dogs that I haven’t trained for a variety of reasons. Q. I am dropping my dog off on Monday at 1pm, and picking up on Friday around the same time. Is that considered four (4) days? A. No, that is five (5) days. A day is to be understood to run from 7am – 7pm. For that reason, I encourage pet parents to drop off their dogs early in the morning, and pick up in the afternoon. Q. My dog weighs 10lbs., therefore will the fee be the same for him as it’d be for a bigger dog, and do you charge extra during holidays? A. Yes, the fee is the same regardless of the size of the dog. All dogs receive the same care and attention regardless of size and breed. My rate is all-inclusive, and there are no hidden extra fees for things such as: walks, administering medication, treats, potty breaks, hair brushing and wiping paws. No, I do not charge extra during holidays. Q. Do you give a discount to active duty military members, and to those with multiple dogs from the same household? A. Yes, active duty military members get a discount on long-term boarding only. No, multiple dogs do not get a discount. Q. What are your vaccination requirements? A. I require a copy of your dog’s current vaccinations that should include: Rabies, DHLP or DHLLP and Bordetella or a Titer test done within the last 3 years. Q. What are your spay/neuter requirements? A. I take spay/neuter dogs as well as intact dogs. Q. Do you have a time limit on how long a dog can stay with you? A. No, there is no limit on how long your dog can vacation with me. Some dogs have stayed with me for one day, while others have stayed with me for as long as 7 months. Q. What should I bring when boarding my dog with you? 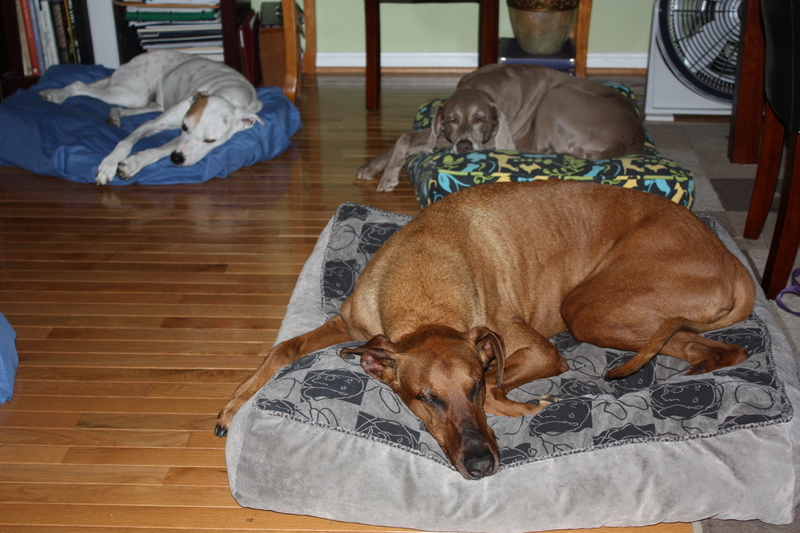 A. Bedding – bring your dog’s clean bed so he can have something that has a familiar smell from home. Leash – Retractable, nylon, or leather. Collar – Make sure it has an ID tag on it. Brush – Your dog will get his hair brushed twice a day. Food – Make sure that it is in a plastic container or sealable bag. Treats – Only if your dog is picky about his treats, or he has allergies. Clean Dog – I stress this because I’ve had dogs come to stay with me that were dirty, to say the least. Regardless of whether your dog has long or short hair, he must be clean. If your dog, and the items you bring along with him are not clean the day you drop him off, I will not be able to board your dog. Please, understand that this is Not a Kennel Facility, but rather my home, and that is why I wipe and brush the dogs that vacation with me twice a day in order to keep them and my home clean.